After you complete Practice Exam 4, check your work by reading the answers and explanations I provide in this chapter. Don’t skimp on this task. Read the explanations even for ­correct answers, but spend an extra minute or two on any questions you got wrong. If you’re short on time, you can quickly check your answers with the abbreviated answer key I provide at the end of the chapter. Don’t you love that a man named Smiles made a statement about failure? Also, don’t you adore being asked to think about failure while you’re taking a test you definitely want to ace? No worries. This question is actually a softball. (For the athletically challenged, a softball is relatively easy to hit.) All you need to do is come up with a few rain clouds that turned out to have silver linings. Then you just have to develop your position — the only reasonable one, really — that people can often learn from their mistakes. Notice the word often in that last sentence. You couldwrite that failure is always terrible and then pen a few hundred words about the spelling bee you lost in second grade, explaining how it crushed your academic career. You could also say that failure is always wonderful, explaining that your ten-years-to-life sentence gave you plenty of time to practice taking SAT tests. But I expect that the nuanced view will appeal to your readers more. Introduction: State your thesis, quoting from Mr. Smiles (I love writing that name!) if you wish. Briefly mention the supporting points you plan to expand on in the body of the essay. For example, you may describe a NASA failure that led to improved safety standards or better equipment. You can include that spelling bee (or some other academic fiasco), too. Don’t ignore literature, which is littered with epic failures. Look for one that has redeeming values. After you have two or three solid examples, you’re all set to start the body of your essay. Conclusion: Instead of restating your introduction in different terms, use your conclusion to move ahead. What sort of failure is helpful? What kind of failure is a disaster with no redeeming features? Answer these questions (and more) in this paragraph. Now that you’ve seen one way to organize your thoughts effectively to address the failure-related essay prompt, it’s time to score your essay. Before you get started, turn to Chapter 8 and read the samples there. Then turn a magnifying glass on your own work, and score your essay using the scoring rubric I provide in Chapter 7; be honest with yourself as you critique your essay. Otherwise, your score won’t help you determine what you still need to work on before you take the real SAT. 2. A. A critic with a grudge is a writer’s worst nightmare! All writers hope their reviewers will write favorably, or at least fairly, about their creations. With this fact in mind, you can quickly cross off Choices (B), (D), and (E) because they all mean “without bias.” (Yes, I know thatdisinterestedly looks as if it means “without interest,” but it doesn’t. It means “without bias.”) Choice (C) is a nonstarter because justifiably and inappropriately are opposites. Go for Choice (A), which expresses the type of attack that fits the sentence’s intended meaning. 5. E. All the action in this sentence is at the end (just like the meal the sentence describes). The diner chose a dessert that resembles Mount Everest (in other words, a rich dish) and merely picked at the main course to compensate, or “make up for,” the dessert’s high calorie count. The other four choices involve desserts that don’t increase the total number of calories, being “tiny” (A), “light” (B), “minimal” (C), or “low-calorie” (D). 6. C. What sort of planning surprises the Yankees? (I couldn’t resist throwing in a reference to my favorite ballplayers.) Planning that doesn’t work or that is incomplete. However, if you chose Choice (A), you fell into the SAT makers’ trap because despite tells you that the planning should’ve worked. What kind of planning should do the job? Meticulous planning (the kind that covers every little detail). Bingo: (C) is the answer you seek. 7. A. This sentence describes a process, a change from some sort of recruit, or beginner, to a soldier who has seen and survived some action. Choices (B), (C), (D), and (E) are tempting because all refer to qualities that a soldier has. However, only (A) contrasts the newness of the recruit with the maturity of the older warrior. 8. C. To crack this one, you need a good vocabulary, one especially rich in words that describe how much a person talks. Choice (C), loquacious, means “talkative” and fits nicely in the sentence. Choices (A), (B), and (D) are antonyms, or opposites, of loquacious. Steer clear of those because if May isn’t opening her mouth, she doesn’t need a lot of time on the phone. Did Choice (E) catch your eye? A combative caller may use a lot of minutes, but not necessarily. Haven’t you ever fought with someone who yells briefly and then hangs up? I have! Hence, the best answer is (C). 9. D. The passage specifically refers to a crank as having “practical applications such as pulling a bucket from a well” (Lines 7–8). Because cranks “did not exist in the ancient world” (Lines 5–6), Choice (A) is wrong. The “first established use” (Lines 12–13) was in China in a.d. 31, but established doesn’t necessarily mean discovered, and no information about the actual invention of the crank is supplied. Therefore, you can eliminate Choices (B) and (C). The fact that the crank was “common by the 1600s” (Line 6) doesn’t mean that the device was overlookeduntil that era. In fact, to become common implies that cranks were around earlier and grew in popularity over time. You’re left with Choice (D), which just happens to be the best answer. 10. A. Line 8 contains the word and, which adds a practical use of cranks to the example already given, that of drawing water from a well. Because you’re adding another use of cranks, you’re moving away from wells and also from Choice (B). What’s added is “a wide variety of situations” (Line 9) in which cranks are helpful, a statement that rules out (D). The passage tells you that cranks change “rotary motion into reciprocating motion” (Lines 10–11) and vice versa, simultaneously eliminating (E) and pointing you toward (A). 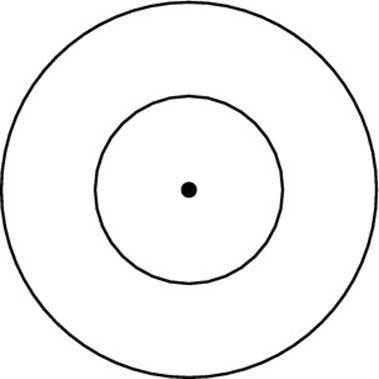 The remaining possibility, (C), bites the dust because nothing in the passage tells you when rotary and reciprocating motion was invented. 11. C. Empedocles had a theory about the “four essences or elements” (Lines 19–20). He is described as “holding” that theory — in other words, “believing in it.” The other choices are all definitions of holding, but none fit the context of Line 18. 12. B. Line 16 tells you that the existence of elements “had been supposed since antiquity,” so elements began as an idea, or theory, long before they were proved real — hello, Choice (B)! Choice (A) is wrong because it states the opposite, and (C) drops out because the only date in Passage I is a.d. 31, and the only dates in Passage II are b.c. dates — from an even earlier time period. Choice (D) may be true in the real world, but the passage doesn’t tell you how long scientists worked. As for (E) — the SAT isn’t Harry Potter’s world, and discoveries may be considered magical without actually being magical. 13. C. A pilot project leads the way, much as the pilot of a plane leads the passengers to their destination. (Their luggage, however, is another story entirely, at least when I fly.) The passage tells you that not all pilot projects can be replicated (Lines 29–30), so (A) can’t be correct. Choices (B) and (D) are random lines drawn from the passage, so you’re left with (C) and (E). Of the two, (C) is better because the passage refers to “successful” pilot projects (Line 22), implying that not all succeed, and (E) assumes that the projects have been “proven effective” (Line 28). 14. D. The passage concerns what the author sees as the best quality of the Grameen Bank — that its model can be replicated and adapted easily, thus reaching many more poor people. The author contrasts this success with pilot projects, which, as he explains in Line 12, reach “hundreds of people” instead of the millions affected by the Grameen Bank. Choices (A), (B), (C), and (E) deal with this limitation. Nowhere does the passage address funding, so (D) is clearly the best answer. 15. A. How do you feel when romance hits? Happy and optimistic, I bet. Your newly beloved can do no wrong. But romance doesn’t last. Either your relationship deepens into love, when you see and accept your beloved’s faults, or it crashes and burns. This real-life experience helps you decode the statement that in the do-good crowd — “circles where poverty and environmental issues are discussed” (Lines 14–15) — small projects are seen with a romantic eye and thus aren’t evaluated fairly, as Choice (A) states. Choice (B) bets that you’ll go for the hug-kiss sort of romance (which, I might add, is wrong); (C) and (E) are the opposite of what the author says in the passage. Choice (D) doesn’t cut it because tiny programs have limited goals, and you can’t compare something to itself. 16. B. A “mesh” (Line 33) is a net, woven from threads. Lines 33–34 cite three types of problems — “social, environmental, and economic” — that are all “injustices.” Thus, poverty, which is the topic discussed in the passage as a whole and in this paragraph in particular, affects its victims in several ways, as Choice (B) states. 17. E. Autonomy means “independence,” and Lines 40–41 explain that Grameen Bank has a “decentralized management structure.” Without a center, power is spread out — precisely the concept that Choice (E) states. Choice (A) isn’t right because Yunus has always had some control; after all, he founded the bank! Choices (B), (C), and (D) are contradicted by the paragraph, so they’re all wrong, too. 18. B. The lines cited in the question show that Grameen Bank had some growing pains. The right formula wasn’t immediately present, though the passage as a whole makes clear that the Bank has succeeded. In 1991, some employees experienced “discontent” (Line 47) and some “carried out their duties” badly (Lines 49–50). These troubles fall into the category of “trial and error” (Line 46) because when you try things, you fail until you happen upon the road to success. Thus, Choice (B) is the one you seek. Choice (A) may have tempted you, but the eventual success of the Grameen Bank shows that the critics were wrong. Choice (C) flops because Bangladeshis “demonstrated those abilities as Grameen staff and borrowers” (Lines 59–60). The successful “decentralized management structure” (Lines 40–41) contradicts Choice (D), and Lines 57–60 kick (E) out of the running. 19. E. Representatives of other developing countries come to Bangladesh “to learn how Grameen works” (Line 69). They, and other organizations within Bangladesh, have used Grameen Bank as a model. Hence, Grameen’s achievements aren’t unique, and Choice (E) belongs in the winner’s circle. 20. D. Lines 74–75 tell you that critics see “the problem of poverty” as “complex,” one needing “a ­solution that [takes] into account . . . ignorance, political powerlessness, and ill health” (Lines 75–78). Ignorance is cured by better education, ill health is alleviated by universal health care, and political powerlessness is reduced by giving political power to the poor. Therefore, all three options are correct, and the right answer is (D). 21. A. To tout is to “publicize and support” an idea. Line 73 states that Yunus was accused of touting his approach as a “magic bullet” that would end poverty. The last paragraph of the passage explains that although Yunus admitted that the problem of poverty was complex, he still favored a simple solution — “investment capital” (Line 96) to “unlock the capacity of poor people to solve many, if not all, of the manifestations of poverty” (Lines 97–99). Therefore, the critics did, in fact, explain Yunus’s ideas accurately. 22. A. Everything in the answer list is a possible meaning of the word conscious, but the poor are aware of politics, not alert or awake or any of the other choices. 23. B. The entire passage praises Yunus for creating a business model that can be re-created over and over again. Yunus, therefore, wasn’t interested in being the only banker for the poor. Instead, he wanted to be a model that others could imitate. Did the quotations about money — Choices (C), (D), and (E) — tempt you? The test makers often try to fool you by placing obvious but wrong answers in the mix. Yunus wasn’t against money (C), and he wanted people to invest, not save (D). Nor did he see his borrowers as foolish. And as Lines 19–25 show, Yunus favored large-scale efforts, not small ones, as (A) states. 24. B. Except for a hint of criticism in Lines 54–57, everything in the passage supports Muhammed Yunus (who, by the way, is one of my own heroes!) and praises his efforts. The only other answers in the running are (C) and (D). However, congratulatory implies that the author is writing to Yunus instead of about him. Sympathetic is a weaker term than admiring, and, because this author goes all out, admiring is the better fit. 1. B. You can do this one as an algebra problem by writing n + 4 = 3n and solving to get n = 2. Or, you can just try plugging in all the possibilities until one works. 3. D. Solving absolute-value equations or inequalities requires solving two related problems. In this case, you need to take and create two inequalities: x + 3 < 5 and x + 3 > –5. Solving each of these inequalities gives you x < 2 and x > –8, so Graph (D) is your answer. 6. B. 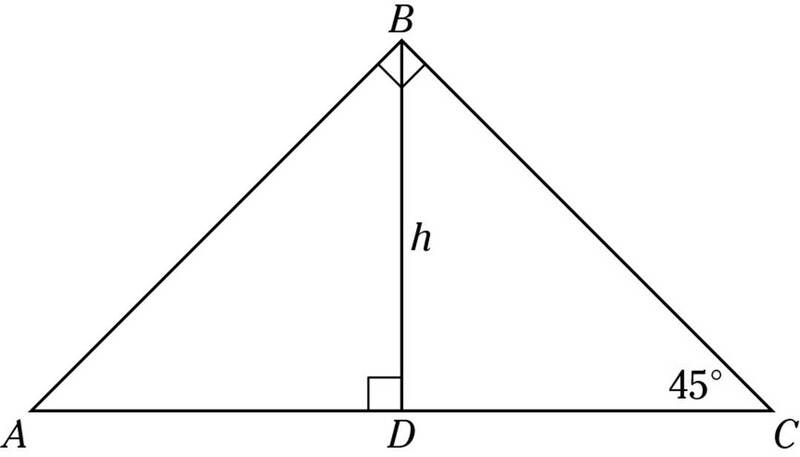 This question is a straightforward, Pythagorean Theorem problem. Just make sure you set it up correctly: (6 is the hypotenuse). Working out this problem gives you 11 + b2 = 36, b2 = 25, and b = 5. 7. A. Looking at the graph tells you that f(2) = –1. So, by rule, g(2) = 2f(2) – 3 = 2(–1) – 3 = –5. 8. A. This problem is a lot like Question 5 in that you can (and should) solve it without ­bothering to figure out what x and y equal. The key is remembering to use the super-useful ­formula I discuss in Chapter 14, the one that says (a + b)2 = a2 + 2ab + b2. Applying this ­formula to the information you’re given in Question 8 tells you that x2 + 2xy + y2 = 53 and x2 – 2xy + y2 = 37. If you subtract the second equation from the first, the x2 and y2 terms cancel themselves out, leaving you with 2xy – (–2xy) = 53 – 37, which becomes 4xy = 16, so xy = 4.
is , which is closest to 20%. gives you x = 3. As always, if you aren’t in the mood to do algebra, you can find this answer by plugging in answer choices until you find one that works. 11. C. If x is negative, then –x and x2 are both positive. Therefore, both Choice (A) and Choice (B) are false. Choice (C) looks true: For example, (–1)3 = –1, and –1 ≥ –1, while (–2)3 = –8, and –2 ≥ –8. As usual, you should stop right there on the real test, but I’ll check the last two choices just for fun. (D) doesn’t work: For example, –2 isn’t greater than or equal to –1⁄2. (E) is true for positive numbers, but not for negative numbers: 6 is greater than 3, but –6 is smaller than –3. Choice (C) it is. 12. A. If you solve this problem using algebra, you need to let the integers equal x, x + 2, and x + 4. (Do you remember this from Chapter 14?) Adding these expressions gives you 3x + 6 = –15, or x = –7. This answer makes the other numbers –5 and –3, and –7 is the smallest. You can also use reason to figure out this problem: Because the numbers add up to –15, the middle number must be one-third of –15, or –5, and, thus, the other numbers are –7 and –3. 13. D. This question is an algebra problem. Let n equal the number of marbles in the jar. Therefore, originally 0.25n (or ) of the marbles are red. When you add 20 red marbles, 0.25n + 20 are now red, out of n + 20 total. Because that’s 50%, you can write 0.25n + 20 = 0.50(n + 20), which gives you 0.25n + 20 = 0.50n + 10. Combining like terms gives you 10 = 0.25n, and multiplying both sides by 4 (or dividing by 0.25) gives you n = 40. 15. E. The original containers have a volume of 2 × 3 × 4 = 24 cubic feet. If you don’t remember the volume of a cylinder, check out the reference table at the top of the Math section: V = πr2h = π(5)2(6) = 150π = about 471. Next, you just have to divide: 471 ÷ 24 = 19.6, or roughly 20. 16. 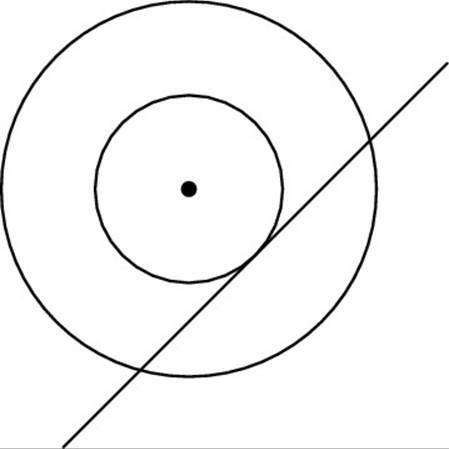 B. Perpendicular lines have slopes that are negative reciprocals, so line m has a slope of –3⁄2. Because m passes through (–6, –4), you can write it in point-slope form as y – (–4) = –3⁄2(x – –6). Distributing gives you y + 4 = (–3⁄2)x – 9, and subtracting 4 gives you y = (–3⁄2)x – 13. That calculation makes –13 the y-intercept, which is what the problem asks for. 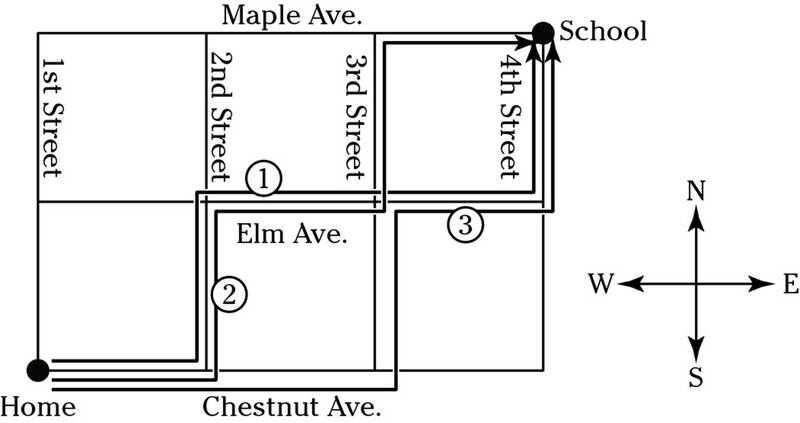 All together, Benjamin has six possible routes. The line touches the circles at three points. Now comes the tricky part: a can’t be greater than –1, but nothing prevents it from equaling –1. It’s tempting to make a = –2, which makes b = 21. But if you let a = –1, then b can equal 20. Because –1 is the biggest you can possibly make a, 20 must be the smallest that b can ever be.
. After all that work, you discover the right answer is Choice (A). 1. D. The not . . . but structure of the sentence tells you that you need an opposite for record. Immediately, you can rule out Choices (A) and (E) because they’re synonyms. Choices (B) and (C) are too narrow; some artists make a scene more beautiful, and some don’t. Some go for symbolism, and others shy away from that technique. But all artists add something to a scene (by interpreting it). Therefore, Choice (D) is the best answer. 2. A. You’re in metaphor-land here, though even without knowing that literary term for a comparison, you probably detected the need for opposites. After all, outcasts are searching for a path from one thing to another. Clearly they want a change. Only Choices (A) and (E) are opposites, but (A) wins because fertile fields are generally viewed as good, while marshes, which are swampy, mosquito-filled areas, aren’t. 3. B. All the answer choices refer to movement, but only (B) fits the leisurely way cited in the sentence. If you’re just killing time, you probably aren’t plodding (A), which has an air of duty and burden attached to it. Choice (C) suggests anger, (D) pride, and (E) haste — none of which fit the feeling in the sentence. 4. C. The clue here is the expression gave way, which implies the passage of time. Choices (C) and (D) address time, but (C) is the better answer because it suggests a move from the beginning to something later. (D) travels in the opposite direction, from the end (final) to, well, even more of an end! 5. D. This question about handwriting tests your vocabulary. A flourish is an extra decoration, perhaps a little squiggle at the end of a word or an extra curve on a capital letter. If you know that definition, this one’s easy to answer because it asks you to contrast fancy somethings withclean, modern lines. 6. C. Line 5 says that we prevent newborns from moving their limbs (arms and legs), so (C) makes sense here. The only other possibility is (E) because the author worries that preventing movement may “interfere with the circulation of the blood” (Lines 9–10) and “prevent the child from growing strong and sturdy” (Lines 10–11). However, because the problems the author mentions are in the future, (E) isn’t a good fit. 7. E. As is often the case with vocabulary-in-context questions, all the answers are definitions of the given word. However, only one makes sense in the context of the passage — health, also known as (E). 9. B. The mother is almost pushing (Line 5) the son toward the father, but the boy and his father are feeling embarrassed and foolish (Line 1). Melodrama features exaggerated emotions and expression of those emotions. The mother expects the son to throw himself into his [father’s] arms (Line 9), but the boy doesn’t feel anything. Hence, his mother’s expectations are unrealistic, as (B) states. 10. B. The narrator’s home is Excenus 23 (Line 2) and he or she is being sent to Earth “to do [his or her] Education” (Line 10). Therefore, Statement I is false because you can’t be sent to Earth if you’re already on Earth. The narrator’s comment that it took “years on Earth to get used to all this water around” (Lines 48–49) indicates that Statement II is correct. Statement III is tricky. Of course no one’s traveled to inhabited planets and returned to Earth, so Excenus 23 is a fantasy — but it’s a fantasy created by the author, not by the ­narrator of the story. Because only II is correct, (B) is your answer. 11. C. The clue to the answer lies after the quotation, when the narrator admits to feeling a kind of desolation (Line 12). Anyone feeling desolation hasn’t adapted, so you can rule out (A). The narrator mentions that “[m]ost people . . . are feeling bad” because of exams (Lines 12–13) but later comments, “I would prefer to think that it is just Finals . . . but it is not” (Lines 30–31), so (B) doesn’t work either. Because the narrator is open about his or her feelings, (D) and (E) are wrong. You’re left with (C), which is perfect because desolation is sadness with a hint of isolation — ingredients of depression. 12. A. According to Lines 18–19, if you’re still sane after going through the two-week period between exams and receiving the results of those exams, you pass the Test. Thus, Choice (A) is your answer. 13. E. Your molars, which you are probably grinding every time you think about the SAT, are the wide teeth in the back of your jaw. They don’t break easily, so (E) fits nicely. Choice (D) is a close second, but broken teeth, though unpleasant, don’t cause their owners to fall apart. Choice (E) is definitely better. 14. A. Once a chick breaks out of its shell, it can’t go back in — particularly after three weeks’ growth. The chick won’t fit, and the shell isn’t the cozy home it was before the chick left it. Move these ideas from chicks to humans, and you see that (A) is your answer. 15. C. The narrator feels sorry for the Examiners who have to read a ton of examinations (an appropriate response, in my experience! ), but the narrator’s friend B says that “it serves them perfectly right” (Line 60) because the Examiners assigned the work. Add in B’s comment about the waiting period between exams and grades being yet another Test and you see B’s harsh attitude toward adults. 16. C. Lines 46–48 tell you that “she and I came here to be miserable in company and away from the rest.” The implication is that the others aren’t miserable. Because the narrator’s distress comes from the realization that he or she doesn’t want to leave Earth, the others may be more willing to do so. 17. D. Only two answers — (C) and (D) — are serious contenders. (C) looks promising — at first glance — because the narrator is attached. However, that attachment isn’t to the Island, which is just a place to spend time until the grades come out. Instead, the narrator is attached to life on Earth, even to the Sea, which was frightening at first. Thus, (D) is your answer. 18. D. The narrator’s father sent a fish-boat (Line 63), but the narrator was too afraid of water to use it. Now the narrator realizes that the time on Earth is limited and has decided to “make the most of Earth while [he or she is] on it” (Line 67). Bingo: Out comes the fish-boat and Choice (D). 19. D. To crack this question, you need to understand the meaning of dichotomy, which is “a split into two contrasting parts.” Paragraph one (Lines 1–11) reveals that Mars has ­distinct halves: ancient cratered highlands in the South and plains that are much younger in the North. Hello, Choice (D)! 20. C. In a typical SAT trap, every answer choice to a vocabulary-in-context question like this one is a definition of harbors, but only (C) makes sense in this sentence. Mars may give or may have given shelter to life, at least according to human imagination (Lines 12–13) and some recent scientific findings. 21. A. Untangling a complicated sentence is your first job here. Percival Lowell shows up in the middle of the second sentence of Paragraph 2 (Line 17). Move him to the beginning of the sentence, delete some extra material, and the meaning becomes clearer: Percival Lowell and some others argued that the linear features observed on Mars were artificial. Artificial is the opposite of natural and is created by some sort of living being. Choice (A) mentions living beings, and the linear features referred to in the passage (Lines 16–17, 21) could be highways or canals. 22. D. Sharpen your cross-out pencil and eliminate all the answers that do appear in the passage. Delete (A) after reading Line 44, which explains the evidence pointing to water on Mars. Scratch out (B) when you hit the discussion of extremophiles in Line 32. (C) is a dud, according to Lines 13–14 (“long-standing speculation that it harbors, or has harbored, life”). Because Lines 34–35 tell you that expeditions “produced either negative or ambiguous results,” (E) isn’t the answer you seek either. What’s left? Choice (D). 1. A. –2 is four units from 2; all the others are significantly closer. 2. C. In 2002, the y-values of the two lines add up to $430,000, which is larger than the amount in any other year. 3. A. From 2000 to 2001, Product X had an increase of $50,000 in profit, from an original $100,000. That’s a 50-percent increase. It had a greater dollar increase ($60,000) from 2003 to 2004, but that was from a start of $220,000, and $60,000 is much less than 50 percent of $220,000. 4. 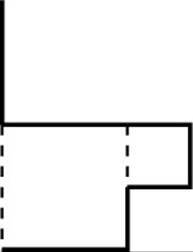 E. You know that line l in the given figure is a straight line and that all straight lines contain 180°. Thus, you also know that the angle marked x must equal 50° because 40° + 90° + 50° = 180°. 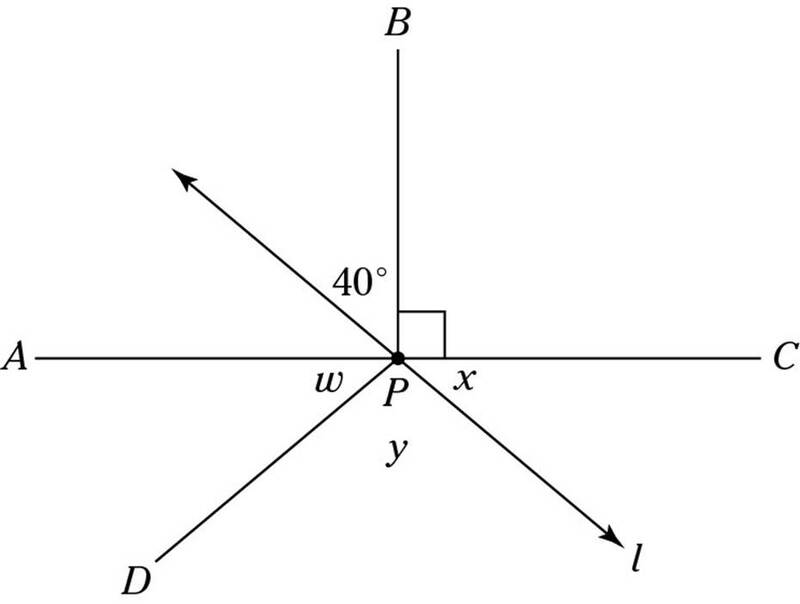 But then angle y must also equal 50° because line l bisects angle DPC, cutting the angle into two equal parts. Because angles x, y, and w make a straight line, the only measurement left for angle w is 80°. 5. D. The question tells you that n > 4, so start by finding the price of the first four shirts. The first shirt costs $15. The next three are 20% off, so they each cost 80% of $15, which is $12. Thus, the total cost of the first four shirts is $15 + 3 × $12 = $51. All subsequent shirts are 50% off $15, or $7.50. But you’ve already paid for the first four shirts in your formula, so they cost not 7.5n, but 7.5(n – 4). Combining results gives you Choice (D). 6. B. Choices (C), (D), and (E) would be negative. (A) might be negative, if k is something like –10 and j is, for example, 4. But (B) must be positive because subtracting k, a negative number, is the same as adding a positive number. Bingo: (B) is your winner. 7. B. You have to admit, this problem is pretty cool: It’s a 45-45-90 triangle cut into two smaller ones. If you call the midpoint of the base point D (as you see in the diagram that follows), you can use your 45-45-90 triangle formulas to determine that AD and CD are both 5 and AB andCB are both . As a result, the total perimeter of ABC is . 8. C. You probably noticed that the length of each string of numbers is the same as the last number: For example, the string ending in 4 is four numbers long. That means the final number will have 1 + 2 + 3 + . . . + 9, or 45, digits. 9. 630. There are 9 possible first digits, 10 possible second digits, and 7 possible third digits. The counting principle tells you to multiply, and 9 × 10 × 7 = 630. 10. 360. 8 × 400 = 3,200 feet, and 2 × 200 = 400 feet. That makes 3,600 feet in 10 minutes, or 360 feet per minute. rewrite the equation as . For this to work, it must be true that 5n = 2n + 33, which makes n equal 11. 12. 280. For a number to be divisible by 5 and have only even digits, it must end in a zero. Then it would need at least three digits for the digits to add up to ten, and 280 is the smallest three-digit number that fills the bill. 13. 72. The 12 students represent the whole class minus one-half plus one-third of the class. students are in the whole class. 14. 47. Because lines l and m are parallel, w + 75 must be equal to 122. Straightforward subtraction gives you w = 47. 15. 8. Question 15 is a quadratic equation, so to solve it, you have to make it equal to zero. Doing so gives you x2 + x – 72 = 0, which factors to (x + 9)(x – 8) = 0; this equation is true when x is either –9 or 8. You can’t grid a negative answer, so go with 8.
you , and dividing by y gives you . those numbers, you get , so a3 = 216, and a = 6. 18. 25. When f(x) = g(x), . To solve this equation, you need to square both sides, which gives you 164 + 5x = x2 – 16x + 64. (Notice that I’m using the same cool formula from Question 8 of Section 3.) To solve the equation, you need it to equal zero, which you get by subtracting 164 and 5x from both sides. That gives you x2 – 21x – 100 = 0, which factors to (x – 25)(x + 4) = 0, which makes x either 25 or –4; go for 25 because you can’t grid a negative answer. 1. E. This cause-and-effect sentence needs a word to connect the cause (the inspector’s arrival) to the effect (the crew’s doing actual work rather than chomping doughnuts). Choices (C), (D), and (E) add that connecting word, but only (E) has the right verb tense. 2. B. Deep in the forests of grammar lies the subjunctive, a term that refers to a verb’s mood. (I’m not kidding. Verbs have moods, and I’m not talking about cranky or rebellious.) But forget the terminology. What you really need to know to answer this question is that the underlined section of the sentence never happened. When you state a condition that doesn’t exist, use were or had, as in “If I were a rich man” or “If I had known.” The actor didn’t swallow a balloon, and the only had around is in Choice (B). 3. C. The answer choices play around with previously, moving it and changing its form. Don’t be fooled; previously or previous isn’t the issue here. Take a look at the subject/verb pair: gusts (the plural subject) and breaks (the original, singular verb). In the grammar world, singular and plural don’t get along. Change the verb to plural, as in Choice (C), and you’re back on track. 4. B. Sentences aren’t sentences unless they express at least one complete thought and contain a subject/verb pair. The original sentence leaves you hanging because you have two descriptions but no verb that matches the obvious subject, plane. The only choice that supplies the missing verb is (B). If you chose (E), you fell into a typical SAT trap. The because statement doesn’t count as a complete thought when you’re writing or speaking formal English — the type of English tested by the SAT. 5. D. Keep it simple and you’re home free here. The matter isn’t necessary because all the reader needs is the topic (“whether the defendant should be found guilty”), so Choice (D) is the answer you seek. Also unnecessary is if it was right — Choice (C) — because what else would the discussion be about? Choice (E) is wordy and has a grammatical error tucked into it. The either. . . or pair has to link elements with the same grammatical identity. In Choice (E), finding the defendant guilty is linked to not — clearly a mismatch! 6. C. When you stick two complete thoughts together in one sentence, you need the right kind of glue. Legal grammatical “glues” include semicolons; therefore, Choice (C) is the winner here. 7. E. First of all, being as and being that aren’t Standard English expressions, so you can cross off Choices (A) and (C). Secondly, the bones were suspicious, not the janitor’s discovery, so Choices (B) and (D) are gone, too. You’re left with (E), which places suspicious with bones and employs because, the proper substitute for being as. 8. A. The original sentence gets the job done without wasting words. The other choices make unnecessary changes in tense (may be causing) or number (one or ones). Choice (E) is just plain wrong because it doesn’t contain a subject/verb pair. 9. D. Recite this rule every day when you brush your teeth (okay, after you brush your teeth so you don’t spit toothpaste all over the mirror): Every sentence needs at least one subject/verb pair that expresses a complete thought. Only Choice (D) meets this standard, pairing device (the subject) with is (the verb). 10. D. The subject of the sentence, luxury department store, is singular, and so is the verb paired with it (is). As a result, the pronoun referring to the store must also be singular. You need the singular its rather than the plural their. 11. B. When you see a list in a sentence, act like Santa and check it twice. The items in the list must have the same grammatical identity. Even if you can’t stick a label on the items, listen to them in your head. Does everything match? In the original sentence, you have a bunch of nouns (spending, depletion, and rate). The last item should be a noun also, and, in Choice (B), it is. If you wanted to change the colon (:) to a semicolon (;), remember that a semicolon tacks on a complete sentence. In Choices (C) and (E), the semicolon isn’t followed by a ­complete sentence, so those answers are wrong. 12. D. People probably prize cute little koala bears, with their oval ears and button noses, but they also likely prize eucalyptus leaves, which provide a key ingredient in cough drops. What’s the author of the original sentence trying to say with the pronoun they? You don’t know because the pronoun is unclear and, therefore, wrong. 13. D. In general, when a comma separates a description from the word it describes, the description is extra — not essential to the meaning of the sentence. When the description provides necessary identification, no comma should separate it from the word it describes. In Question 13, you don’t know which child the monkey is intended for until you read the phrase “any sick child who wants to play.” Every part of that description is essential, so the comma is inappropriate. 15. C. Repeat after me: “The reason is that. . . .” Got it? The reason is because is common in everyday speech but incorrect in Standard English. In case you’re curious about the underlying grammatical logic (and if you are, you seriously need to get a life), reason is a noun and must be balanced in the sentence by another noun or an adjective. (The word that introduces a noun or adjective clause.) The word because, on the other hand, starts an adverb clause. 16. B. Person (as in first, second, or third person) is the grammatical term that tells you whether you’re talking to (the you form), about (the he, she, they, or other noun form), or as someone (the I form). Grammarians adore consistency, and they don’t allow you to switch from one person to another without a very good reason. In Question 16, the sentence begins in second person (you subscribe) and then morphs into third person (a viewer). Penalty box! To correct the sentence, change you subscribe to one subscribes or a person subscribes. You could also change a viewer to you, but a viewer isn’t underlined, so it’s not an option. 17. B. The –er in the word clearer creates a comparison; so does the word more. You don’t need to double dip here. Drop the more and the sentence is fine. 19. B. The expression his or her is singular and may not refer to artists, a plural noun. Also, the word lifetime must be made into the plural word lifetimes. 20. A. The pronoun each has only four little letters, but it’s incredibly powerful. No matter what you place after the word each, the pronoun remains singular and takes a singular verb. In this sentence, however, the verb agree is plural. 21. D. Logic rules here. The whale is in a novel, which is by definition a work of fiction. Therefore, you can’t compare the whale to any animal in fiction without removing the whale from that group. Instead, you have to compare the whale to any other animal in fiction. 22. A. The expression a number of really means “some,” so the subject of this sentence is actually some letters. You can’t match that plural subject to the singular verb has, so Choice (A) is the answer you seek. 23. D. To is a preposition and, therefore, needs an object. The pronoun I, however, can’t be an object. Hence, Choice (D) is the one you want. In case you were wondering, the correct expression is to you and me. 24. D. More is what you use when you’re comparing two items; most is what you want when you’re choosing the extreme from more than two items. The given sentence compares one smile — the baby’s first — to any other, not to all others. The expression any other sets up a comparison between two, so more is appropriate and most is wrong. 25. C. The smooth — and correct — version of this sentence includes the expression “how to improve attendance while avoiding overcrowded classrooms.” As you see, Choice (C) is where you need to make the change. 26. A. Actors are people, and people are generally referred to with the pronoun who. 27. D. Being isn’t a verb, or at least it isn’t a complete verb. Read the sentence aloud and you can probably hear that the sentence doesn’t make sense as written. Change being to is and you’re home free. 28. C. How may the statues be identified? Easily — an adverb. Not easy — an adjective. 30. E. Both sentences are short, so combining them is a good idea. The key is to glue the sentences together smoothly without adding any grammatical errors. Choice (B) doesn’t do much beyond joining the sentences with a semicolon. Also, the second pronoun it in Choice (B) technically could refer to either ladder or sticker. (Yes, I know. Logic tells you which noun it replaces, but grammarians, including those who write SAT questions, prefer sentences that follow even the pickiest rules.) Choice (C) doesn’t make the cut because which describes it, the stand-in for “ladder,” and the ladder doesn’t tell anything. The sticker does! Choice (D) starts off well, but me falling isn’t Standard English. The correct version is my falling or just falling. 31. B. The first paragraph contains two examples of frivolous (not serious, silly) lawsuits — one potential and one actual. Yet the writer hasn’t provided a transition sentence to guide the reader from the warning label to the ankle injury. Choice (B) does the best job of explaining how the ladder is connected to the ankle. 32. C. Choice (C) groups all the examples together and paves the way for Paragraph 2, which asserts that common sense has evaporated in the world of lawsuits and product liability (legal responsibility). 33. C. People is plural, and so are the pronouns they and their. Choice (C) matches plurals with plurals. The original mixes singular (person) with plural pronouns. Choice (B) unnecessarily (and incorrectly) shifts from talking about a person to you, a pronoun that addresses the reader directly. Choice (D) introduces a set of unnecessary commas, and (E) provides no context for the pronouns they and their. 34. B. Sentence 13 says more or less the same thing as Sentence 12, but 13 is more specific. Dump Sentence 12 and let Sentence 13 make the point. 35. C. The writer supplies several examples to make the point: the ladder, the ankle, the coffee, the medicine, and the matches. 1. B. The most important word in this sentence is instead because it signals a change in direction. Choice (B) explains — accurately, in my experience — that peers, or equals, seem more reliable to teens than their parents do. Choice (C) is close because you can imagine a teen considering parental advice and then checking with experts. However, (B) is a better fit because it expresses a sharper change in direction. 2. A. This question is easy to answer if you know that dogmatichas nothing to do with little furry tail-waggers and actually refers to people who hold onto a position no matter how strong the opposing arguments are. The noun, by the way, is dogma, a fancy word for a set of beliefs. 3. D. What do you do with information (data) once you have it? You analyze it, as Choice (D) says. Choices (A), (C), and (E) are close, but each is more specialized. Survey means “to get an overview,” probe means “to dig deeply, usually with a narrow focus,” and appraisegenerally refers to an evaluation of a specific situation or object. 4. C. To answer this question, put on your stethoscope and think like a doctor. What do doctors do when someone is dizzy? They try to determine the cause. Thus, you need a synonym for determine, and ascertain, which means “to become certain of,” is just the answer you’re looking for. 5. E. If you’re physically fit, you probably won’t get hurt, according to this sentence. (Real life is a different story. There was this pothole . . . but back to the SAT.) Another answer that may have tempted you is (A) because motivated athletes tend to work out a lot and become physically fit and less vulnerable to injury. Wait a sec! Fit is Choice (E), so you can skip the middle step expressed in Choice (A) and go directly to the best answer. 6. A. The answer choices are obvious if you know what the words mean. Palatable means “agreeable,” and abhorrent means “hateful.” Diverting means “entertaining”; onerous means “burdensome.” (Interesting you already know. It explains what SAT questions are not.) Okay, why would a senator phase in a tax increase? To make the voters squawk less. Bingo: Choice (A) is what you’re looking for. 7. D. The “wash from the snow mountain” (Lines 9–10) is described as something “down which some water had run after a big storm” (Lines 10–11). Plus, the narrator and his friend walk up the wash (Line 16). Choice (D) fits both of these descriptions. Because the narrator and his friend are trying to reach the snow and because water is scarce, the other choices don’t fit the passage’s context at all. 8. C. Lines 20–21 state that “it was quite a question if we could live long enough” to reach the snowy mountaintops and obtain water. Because Choice (C) deals with death, it’s the best one here. True, the travelers are probably tired, but the passage doesn’t provide direct evidence to support that idea, so (A) is out. The passage directly contradicts the other answers. 9. A. Only two choices, (A) and (D), are serious contenders for “proverb of the year” — or at least “proverb of Passage I.” The travelers work together, each agreeing to summon the other when one finds water and then sharing water and food. Therefore, (A) describes their communal values perfectly. (D) has a lot going for it because the lack of water has brought them close to death, but the passage doesn’t reveal anything about their attitude toward water before it was scarce. Okay, (A) is the better choice. 10. A. The brush survives with very little water and is stunted. Passage II begins with a discussion of a plant that’s very tall when rain is abundant but tiny during dry spells. Thus, the brush has adapted to the dry environment described in Passage I. 11. E. The travelers set out early because they wanted to “get as far as [they] could before the hot sun came out” (Lines 2–3). They searched for water, not ice, and, therefore, found the ice by chance. Had they begun their search a little later, the narrator says, the ice would have melted into the sand. Providential means “lucky,” and that’s what the travelers were because of the facts stated in reasons II and III. 12. A. All the answer choices are true, at least in my opinion and, in some cases, in the directly stated opinion of the author of Passage II. However, Lines 49–50 deal with the ability of plants to adapt to extreme conditions, an idea directly expressed in Choice (A). 13. B. The quoted lines refer to the adaptation skills that allow a species to grow tall when it rains and to remain short when it doesn’t. The like qualities mentioned are survival skills because a tall plant in drought conditions would quickly die from lack of water. Did Choice (C) trap you? Nature writing often advocates a back-to-the-land mentality because people who write about nature tend to love it, regardless of the number of flea bites or twisted ankles they endure while exploring it. However, this question isn’t about the writer’s attitude but rather about a specific statement. 14. C. To answer this question, try knocking off the wrong answers one by one. Choice (A) fails because Lines 61–65 make a big deal out of the relationship between size and rainfall amounts. The stocky stems (Lines 70–71) help the plants survive, so you can eliminate (B). Lines 67–69 discuss leaf characteristics; therefore, (D) doesn’t work either. Choice (E) doesn’t cut it because the dunes are protective (Line 71). Nowhere does the passage mention age, probably because the author is concerned with the survival of species, not that of an individual plant. Choice (C) is the right answer. 15. D. Lines 81–83 explain that a hapless party died “where shallow wells would have saved them.” (Time to strengthen your vocabulary muscles: Hapless means “unlucky” or “miserable.”) The travelers didn’t know where or how to find those wells. As the passage says, “It is this nearness of unimagined help that makes the tragedy” (Lines 78–79). 16. A. Death Valley is the sink (Line 86). Picture the shape of a valley and the shape of a sink, and you see that Choice (A) is the answer you seek. 17. C. The second paragraph of Passage II discusses the hazards of desert travel and refers to the toll of death (Line 86). Put those two ideas together, and Choice (C) emerges as the correct answer. 18. C. As Lines 84–85 explain, “Properly equipped, it is possible to go safely across that [desert].” The travelers in Passage I survived, but only by chance. They arose early to beat the heat and thus found unmelted ice to sustain them (keep them alive). 19. D. Passage I takes you across Death Valley with one party of travelers. Passage II discusses how desert plants survive and how human travelers can minimize risk. In other words, Passage II is more scientific than Passage I.
triangle’s base and height, which are all you need to know to determine the area: . 2. C. If you plug in the given numbers, you see that 0 and 1 both work, but –1 doesn’t. 3. B. As I’m sure you remember, in ratio problems the total number of objects (students, in this case) must be divisible by the sum of the numbers in the ratio (5 + 3 = 8). Specifically, you can call the number of seniors 5x and the number of juniors 3x, and write 5x + 3x = 40, which gives you x = 5. Plugging that number back in to the equation gives you 25 seniors and 15 juniors. 4. E. Choices (A) and (B) aren’t the right shapes to be folded up into boxes, so you can eliminate them right away. Choices (C) and (D) are the right shapes, but you’d have to match a 6-cm side with a 5-cm side, and doing so would leave gaps in the box. Only Choice (E) fully closes up the box. you can write 10 = 3(3) + b, so b = 1. That makes the equation y = 3x + 1, and plugging in 8 gives you 25. 6. B. Nothing fancy here: When you double all the sides of any shape, you quadruple its area. In general, if you multiply all the sides by n, you multiply the area by n2, so you multiply the area of the original pentagon (20) by n2 (22). 7. D. You probably realized that you need to square both sides, but did you remember to isolate the radical first? You need to add 3 to both sides before squaring, giving you . Now when you square both sides, you get n + 5 = 49, so n = 44.
which is very close to –3. Because this line slopes downward, it would rise about 6 units as you moved left from 2 to 0, which means the y-intercept would be around 95 + 6 = 101. Thus, (A) is your best choice. 9. C. Let n stand for the number of people in the study group, aside from Sergei. So Sergei had 3n + 2 candies. When one person didn’t show up, he had 4(n – 1) + 1 candies, which is still the same number of candies. So 3n + 2 = 4(n – 1) + 1, and the right side simplifies to 4n – 3. Solving 3n + 2 = 4n – 3 gives you n = 5, but be careful! The problem doesn’t ask for the number of people, but for the number of candies. So plug 5 back in to the equation 3n + 2 to get 17. Three little sides equal 3 cm. The medium square has two full sides and one half-side contributing to the perimeter, for 2 × 2 + 1 = 4 + 1 = 5 cm more. And the big square gives a half-side to the perimeter, for another 2 cm. Add them all together and you get 3 cm + 5 cm + 2 cm = 10 cm. 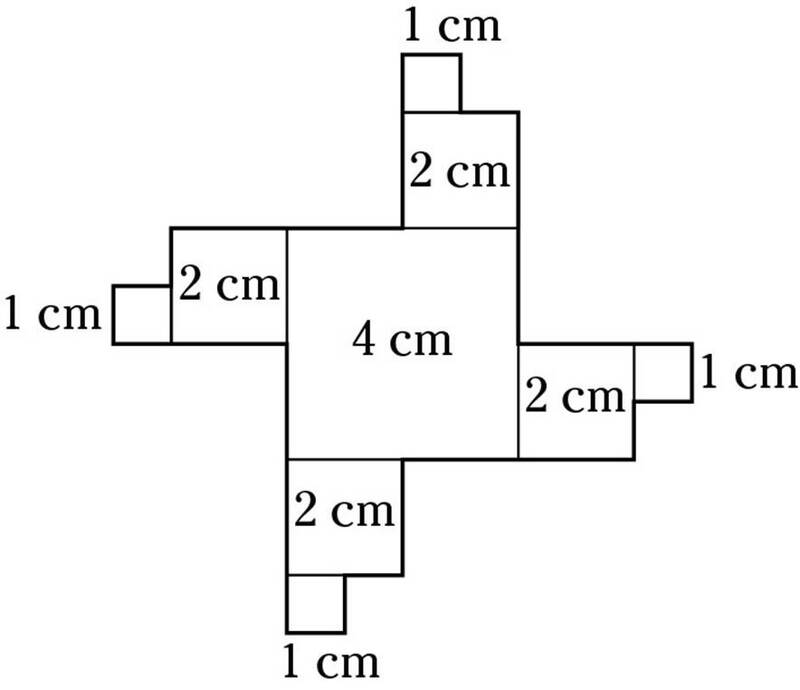 Because the figure has four sides just like this one, the answer is 10 cm × 4 = 40 cm. 11. B. Four grandfathers are at the reunion. Because every one of them is also a father, include them in the 12 men who have a son present. That leaves 12 – 4 = 8 other men who have a son present. These 8 men could all be the grandfathers’ children, so they can be counted in the 21 men who have fathers present. That leaves 21 – 8 = 13 men in the youngest generation. In total, you have 13 + 8 + 4 = 25 men. 12. D. From the instructions, you can write x = 2y and z = x – 45. Because the angles must add up to 180°, you have x + y + z = 180. Substituting gives you 2y + y + x – 45 = 180, and substituting 2y for x again gives you 2y + y + 2y – 45 = 180, which becomes 5y = 225, and y = 45. Therefore, x = 90 and z = 45, which makes the triangle a 45-45-90 triangle — in other words, an isosceles right triangle. You can now see that the distance EH equals 12, which means F is 6 units from H.
14. D. b + 2 and b – 3 differ by 5, so any number that goes into both of them must also go into 5. But the only numbers that go into 5 are 1 and 5, and you know that a is bigger than 1, so a = 5. On the list of answer choices, 33 is the only possibility for b because 33 + 2 = 35 and 33 – 3 = 30, and both of these numbers are divisible by 5. 15. E. Let b equal the number of students in Ms. Belton’s class and j equal the number in Ms. Jimenez’s class. Now you can write 0.45b + 0.30j = 0.40(b + j). Distributing gives you 0.45b + 0.30j = 0.40b + 0.40j, and combining like terms gives you 0.05b = 0.10j. Dividing by 0.05 (or multiplying by 20) gives you b = 2j, so Ms. Belton’s class has twice as many students as Ms. Jimenez’s. subtraction, and you end up with Choice (B). 1. C. The verb form that begins the sentence has to apply to the subject. In the original sentence, the lightning is jumping off the sofa. Unlikely! The only two choices that provide the right subject/verb pair are (C) and (D). Choice (C) is better than (D) because in Choice (D) the verb emphasizes that an action (jumped) took place before another action (exploded). Logically, the frightening weather took place more or less at the same time as the jumping, so had isn’t appropriate here. 2. D. The original sentence has two problems. First, the sentence begins with active voice, the grammar term for a sentence in which the subject (the theater company) is performing the action (applied). The second part of the sentence shifts to passive voice; now the subject (still the theater company) is being acted upon. Because you shouldn’t shift from active to passive voice for no reason, you can cross off Choices (A), (C), and (E) right away. The second problem is the placement of only. This descriptive word should precede the part of the sentence it describes. The sentence compares funding sources. The company asked for money from many sources, but only one — the National Endowment for the Arts — came through. You’re not comparing actions (only gave, didn’t audit or give a part to the director’s pal or something else), so the only shouldn’t precede gave. Choice (D) gets rid of the passive voice and places the only where it belongs. 3. D. Paired conjunctions (words that join) must link similar grammatical elements. In other words, whatever follows neither must match whatever follows nor. In the original sentence, good nutrition and how regular exercise is beneficial aren’t the same grammatically. The second has a verb, and the first doesn’t. Only Choice (D) links a matching pair: good nutrition and regular exercise. 4. B. When a sentence begins with a descriptive verb form, the description must apply to the subject of the sentence. The storm can’t skid or drive. Clearly the subject has to be driver. Choices (B), (D), and (E) put the driver in the driver’s seat, so to speak, but (D) and (E) aren’t complete sentences. There you go: (B) is your answer. 5. C. The checklist is simple and so is the answer. The it isn’t necessary, so (A), (B), and (E) are out. Choice (D) creates a fragment, not a complete sentence. Choice (C) gets the job done nicely. 6. C. The subject of the sentence is mynah birds, which is plural. Therefore, any pronouns referring to mynah birds must also be plural. Cross off everything with its instead of their, and you’re left with Choices (C) and (E). The verb tense in (E) is wrong, so (C) is the answer you seek. 7. E. The expression equally as has caught on in everyday speech, but it’s not Standard English. Drop the as and you arrive at Choice (E) easily. 8. B. A weak little punctuation mark, the comma, isn’t allowed to join two complete sentences, as it does in Choice (A). Omit “she was” and add the conjunction and; now the second half of the sentence adds more information about Sandra Day O’Connor without creating a run-on sentence. 9. A. The sentence mentions two actions, moved and was located. Both took place at the same time — in the past. Therefore, you need two past-tense verbs, which the original sentence supplies. Did Choice (B) fool you? Has been located is in present-perfect tense, which connects past and present. But the phrase until recently tells you that the present isn’t present in the sentence, so (B) doesn’t work. 10. E. The architects have one job: to design. They’re making an attempt at that task. The and in the original sentence incorrectly creates two separate jobs — to try and to design. Choice (E) fixes the problem. 11. B. Pretend that the commas around “performing human sacrifices in religious rituals” are little handles. Lift that description out of the sentence, and you immediately hear a double subject, “The ancient Mayans they understood.” You don’t need a second subject! Choices (B) and (C) fix that problem, but Choice (C) adds an extra verb to pair with they. Why complicate the issue? Choice (B) does the job without adding unnecessary words. 12. D. The speaker in the sentence didn’t know this equation: one peanut-butter cookie = one trip to the emergency room. To express what grammarians call “condition contrary to fact,” you need to use had (for action verbs, as in this sentence) or were (for states of being) in the portion of the sentence that isn’t true (called the if statement). Choice (D) is correct. 13. C. An appositive is a fancy English-teacher term for an equivalent. An appositive should match the term it’s paired with in all things grammatical. Roger and him is the appositive of campers. Why him and not he? Because campers is the object of the preposition to, and him is the pronoun you want for objects. 14. A. The sentence tells you that one — and only one — book in the library contains a recipe for salted codfish (possibly because salted codfish tastes like used shoes). Back to the SAT: The statement beginning with that has to be singular because logically that refers to only one, not to books.